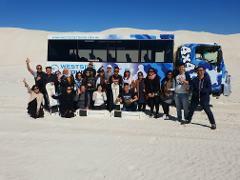 Adventurous full day Pinnacles and Lancelin sandboarding and 4WD experience group tour - every SUNDAY! Join us on an adventurous group tour, every Sunday, to The Pinnacles in Nambung National Park and to the Lancelin sand dunes for a 45 minute 4WD and sandboarding adventure. Not for the faint hearted! Packed lunch included.